The Grave of Dreams in an exhibition by teenage Gazan painter Malak Mattar – shown at Greenbelt Festival and throughout September at the Palestine Museum, Bristol. 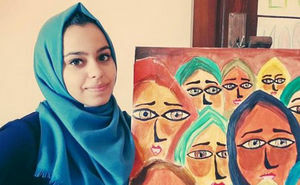 With the support of the Westhill Foundation, we invited 19-year-old Gazan painter Malak Mattar to come to Greenbelt Festival 2018 (24 – 27 August), in order for us to mount an exhibition of her work called The Grave of Dreams –telling the story of her upbringing and life in her blockaded homeland, so often viewed with suspicion and fear and branded as Islamist. We were able to courier across 19 pieces of her work and have them all beautifully mounted on canvas stretchers here in the UK. 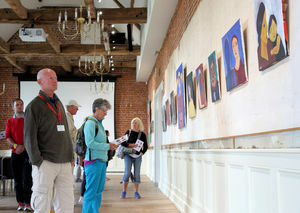 We were also able to negotiate for permission to use and then to hire a beautiful room called the Tapestry Suite in the main house at Boughton House (the grounds of which we use to stage our annual festival) within which to stage the exhibition. This was a bitter blow for Malak and Greenbelt. It wasn’t the financial outlay (which we were too late to be able to reclaim), it was her poignant absence, her baring from travel – it seemed so pernicious given that she has lived her life blockaded and hemmed in and that what we were attempting to provide her was an opportunity to break out and tell her story more directly. 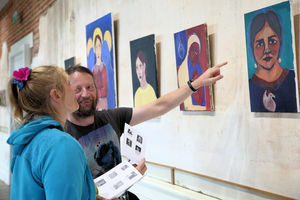 We had appointed a professional curator – James Walmsley, from Manchester – to stage the exhibition at the festival and so the work was hung and described wonderfully. And each day, during the opening times of the exhibition, we ‘skyped’ Malak into the room so that she could speak to those viewing her work and they could ask her questions. The room had built in AV facilities and this communication proved to be a very powerful experience for all those involved – heightening the injustice of Malak’s absence and yet somehow drawing the viewers even closer to her constraints as they engaged with her work. 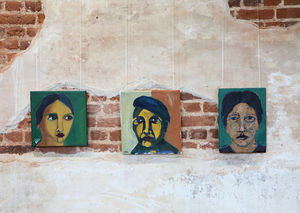 As a means of building trust and understanding between very different cultures of a very complex situation, staging Malak’s exhibition (even in her physical absence) enabled Greenbelters to gain a much deeper and more visceral sense of what it is like to grow up in Gaza. It also enabled a young Muslim woman to share her instinctive talent and work with a largely white Christian audience – and for there to be open dialogue and appreciation in the exchange. It proved a very powerful experience for all involved. It was important for us that we honoured Malak and her work and story by staging the exhibition as professionally as we possibly could. Being able to use the Tapestry Suite in the main body of Boughton House – a first for us as a festival – and ensuring her work was professionally mounted and curated, meant that we achieved a truly memorable and impactful result, both for our festival audience and for Malak herself. After the festival weekend, we shipped Malak’s work onto Bristol where it was hung in the Palestine Museum in Bristol where it was then viewed by the public on each weekend during the month of September. Our own curator arranged for this additional exhibition opportunity and once again went to hang the work himself. At the end of that time, we were able to have all of Malak’s work carefully wrapped and shipped on. We felt that we had been able to add value to her project. 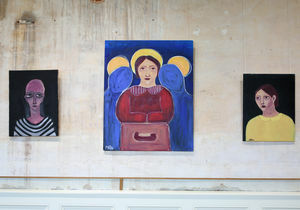 Malak was able to sell some of the pieces as a result of the two exhibitions. And, in addition, she painted a beautiful piece simply entitled “Greenbelt” for us to express her gratitude for what we had been able to do and we have acquired this painting to hang at our offices so we can continue to tell her story to all those who visit us year-round. For more information or to contact Greenbelt Fesivals please see their webiste.